The Flash Season 5 Episode 11 Recap and Review: "Seeing Red"
“Killer Frost doesn’t need a weapon. Killer Frost is the weapon,” says Caitlin (Danielle Panabaker) to Ralph (Hartley Sawyer) when he tries to hand her a gun as Team Flash is about to try to take on Cicada (Chris Klein) in season five episode 11 of The CW’s The Flash. As the episode begins, Dr. Ambres (Lossen Chambers) gets a surprise visit from Orlin Dwyer (aka Cicada) who’s unhappy he can’t get to his niece because the police are keeping a guard on her room 24/7. Dr. Ambres informs him there’s still no change in her condition and that he needs to get back to the plan of exterminating all the metas. She tells him she knows someone who can help them. Cicada takes on two more metas, killing one as the other escapes. Later, Barry (Grant Gustin) and Nora (Jessica Parker Kennedy) investigate the murder of the meta and quickly realize Cicada is back. At S.T.A.R. Labs, Caitlin’s getting fed up with her alter ego Killer Frost who keeps sabotaging Caitlin’s efforts to help Cisco find a meta-human cure. Ralph walks in on Caitlin yelling at Frost and she tells him what Frost is up to. Ralph asks if Caitlin has asked Frost why, and Caitlin explains every time she tries to talk to her about it she sings the Barney song “I love you” and then goes silent. Caitlin also shares with Ralph that in order to make the cure, she needs meta DNA that hasn’t fully bonded with dark matter, which means DNA from a new meta. The only problem is Cicada has killed the new metas. In another part of the lab, Sherloque (Tom Cavanagh) is investigating Nora’s time journal. An alarm goes off at S.T.A.R. Labs and Team Flash – Barry, Nora, Killer Frost and Ralph – suit up to fight Cicada. Cisco (Carlos Valdes) is absent because he’s at the Tannerhauser site working on the meta-human cure. Team Flash arrive just in time to stop Cicada from killing a meta he wounded. Ralph uses the phase blaster on Cicada and Frost hits him with a strong icy blast. The Flash turns to Frost and says they need Caitlin to attend to the injured meta. Caitlin appears and quickly examines the meta, determining she needs to go to the hospital. Cicada uses his dagger and slams it on the ground knocking The Flash, Caitlin, and Elongated Man off their feet. Cicada quickly goes up behind XS and grabs her. He lifts her off her feet with his strength and power-punches her in her back, right on her spine. (Basically reminiscent of Bane breaking Batman in The Dark Knight Rises). Back at S.T.A.R. 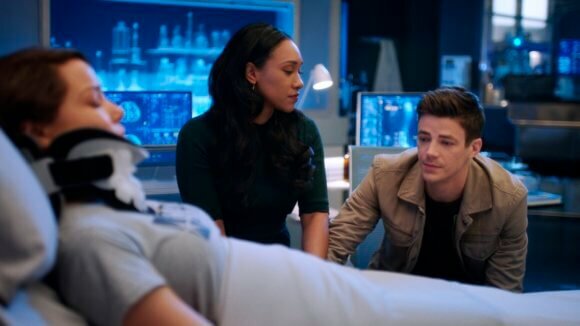 Labs, Caitlin examines an unconscious Nora and tells Barry and Iris (Candice Patton) that Cicada fractured two vertebrae in Nora’s spine and since she’s flooded with dark matter, her speed healing isn’t working. It will take time to heal. Nora wakes up and slowly realizes she can’t move her legs and that it hurts to breath. She begins to panic and gets upset, but Barry, Iris, and Caitlin explain what happened to her and that she should be okay but it will just take longer than usual. In the cortex, Barry, who’s very angry about what happened to Nora, tells Sherloque to start earning his money and find a way to find and stop Cicada. Ralph and Sherloque brainstorm and realize after looking at Cicada’s past victims they were all criminals at one point. The team realize Cicada got his list from someone at the CCPD. Cecille (Danielle Nicolet) and Barry talk to Captain Singh (Patrick Sabongui) and explain how Cicada is picking his victims. Singh gets defensive, not wanting to believe it’s one of his officers. Barry becomes angry, and Cecile assures Barry she and Singh will handle it. As Barry and Cecile walk out she says she’ll call in favors with the FBI and find a way to get the metas on the list out of town with new identities. Over at S.T.A.R. Labs, Nora’s condition has barely improved and she starts to get concerned that her speed healing won’t kick in. Frost destroys Caitlin’s work on the meta-human cure. Ralph arrives and tells her he understands protesting but she’s going overboard. “Maybe Caitlin will get the hint now,” replies Frost. Barry walks in and asks Frost for her help in finding the metas on the list and getting them ready for the transport Cecille is setting up. Barry, Ralph, and Killer Frost locate Amunet’s ex-henchman Norvock (Mark Sweatman) to convince him to help them find the other metas and prepare them to flee the city. Meanwhile, Cecille informs Singh she’ll need roadblocks set up during the transfer. Singh agrees to handle it. As Cecille is leaving, she gets a feeling from Officer Jones. She asks him if he’s okay and he says yes, but he seems off to her. Team Flash and Norvock gather all the metas for transport, except for Peek-a-Boo. One of the metas starts to mouth off about trusting The Flash and says she would rather fight Cicada. Barry, who has no patience at this point and is still furious over what Cicada did to Nora, tells the metas if they want to be dumb and go off on their own, they are free to go ahead. A few start to walk away when Norvock confesses he fought Cicada a few days earlier with a meta friend. He ran but his friend stayed and fought and Cicada killed him. Norvock tells the metas to do what they want but he’s trusting The Flash because he wants to live. The other metas stay put. Killer Frost talks to Norvock, surprised he helped convince the other metas to stay. He confesses that he was originally a good guy. He worked at the Central City Zoo in the snake area until one day a snake got out and attacked a kid. He was able to get the snake off of the child when he was hit by the particle accelerator explosion. He now has a snake living in his eye and everything has gone bad. Norvock leaves and Ralph, who was listening, tells Killer Frost he feels a little bad for the guy. “Why? He’s just looking out for himself,” replies Frost. Ralph points out that he’s afraid and it’s the fear that’s making him act that way. Frost says she wouldn’t know what that’s like and Ralph brings up Caitlin and the meta cure. The Flash talks to Peek-a-Boo who still doesn’t want to go with them and won’t listen to reason. As they talk Peek-a-Boo notices she can’t use her powers and Barry realizes Cicada is close. Barry yells for Peek-a-Boo to run. Cicada appears and a fight with The Flash ensues. Barry gets away from Cicada long enough to open a breach. He and Peek-a-Boo escape through it. Back at S.T.A.R. Labs, Nora’s finally able to wiggle her toes. She smiles as Sherloque enters and congratulates her, saying she’ll be up and chasing Cicada in no time. Sherloque asks if maybe when she’s feeling up to it she can take him to The Flash archives and museum. Iris interrupts and asks to talk to Sherloque outside. She wonders why he’s interrogating Nora. He explains he’s trying to solve a mystery. Iris informs Sherloque he’s going down the wrong road. Cecille shows up and senses the anger in Barry. She reminds him he can’t give into it because that’s what has consumed Cicada – his anger. She realizes who’s the mole and tells Barry she’ll handle it. Ralph approaches Killer Frost and reveals that after hearing some of the other metas’ stories, he’s for the cure. Killer Frost confesses she’s worried that one day Caitlin might wake up and decide to take the cure and she wouldn’t be around to protect Caitlin anymore. Ralph tells Frost that when DeVoe made her go dormant last year all Caitlin could talk about was finding a way to get her back. “She protects you too,” says Ralph to a happily surprised Frost. Cicada grabs Officer Jones and tells him the metas are not where they’re supposed to be, according to the list. Jones reveals the plan Cecille has to transport them and indicates their location. Cicada uses his dagger to suppress Barry’s powers and assures him he can’t win this fight. “I bet I can. We haven’t been formally introduced. They call me Killer Frost…let me show you why,” says Killer Frost, creating an ice dagger and fighting with Cicada in one of the best choreographed fight scenes since the series began. At one point Cicada throws the dagger at the back of Killer Frost’s head and Caitlin’s voice tells Frost to duck which she does, saving them both. Cicada’s no match for Frost and she actually stabs him with her ice dagger. Cicada’s powers weaken enough for Barry to get his powers back at full force. He speeds over and starts beating Cicada to a pulp. On the other side of the building Ralph has stretched himself onto the chopper and stretches down to grab each meta and bring them onto the chopper. Norvock coordinates the process and helps the metas not panic as they get ready to fly up to the chopper with Ralph. She reaches Barry and he leaves Cicada lying on the floor. Barry gives his daughter a hug while Cicada gets up. The dagger finally finds its way back into his hands and he flies off. The next day at S.T.A.R Labs, Sherloque’s praising the fight team of The Flash and Frost (aka Flash Frost) and suggests that Cicada will not want to tangle with them anytime soon. Cecille and Singh bust Officer Jones after finding the list of metas that he downloaded from the CCPD on his computer. Cecille reads his mind and discovers an evil meta controlled Jones’ mind at one point and made him do awful things which made him hate all metas. At S.T.A.R. Labs, Caitlin walks into the speed lab and finds a brand new whiteboard with all her equations on it, a gift from Killer Frost. “This is as close to an apology as you’re going to get.” Caitlin assures Frost she would never take the cure. Frost asks if she’s cool with them growing old and gray together in the same body and Caitlin confirms she is. Frost tells Caitlin she left her a gift. Caitlin finds a clear ice ball with blood inside…Cicada’s blood from her ice dagger. Caitlin now has the DNA she needed! Sherloque has determined after running handwriting analysis that two people wrote in Nora’s time journal. He wonders who is the mastermind. As the episode ends, Barry tells Iris he never knew he could love someone as much as he loves their daughter. Suddenly Barry has an idea and realizes how to stop Cicada. “He’s a father too. We save his little girl,” says Barry. Fast-paced, suspenseful, and featuring some very impressive fight scenes, season five episode 11 titled “Seeing Red” puts The Flash back in center stage as he tries to protect the metas of Central City from Cicada’s killing spree. The episode also revealed more about Caitlin and Killer Frost’s ever-growing relationship. In addition, the episode brought together the crime-fighting team of Flash Frost and revealed them to be an unbeatable duo. The stand–out performance goes to Danielle Panabaker who juggles her double duty of being both Caitlin and Killer Frost wonderfully as each character had about the same amount of screen time. Panabaker portrays both the intelligent, sensitive, goodhearted, and dedicated Caitlin and the tough, wise-cracking, sassy, and formidable Killer Frost brilliantly. These two characters couldn’t be more different even as they reside in the same body, and Panabaker brings them to the small screen with a full and complete performance. With Team Flash about to try to save Cicada’s niece and Sherloque getting closer to discovering Nora’s secret, it should get very interesting and complicated for the heroes very quickly.